As the FIFA World Cup started in Russia last week, here is how Asia- Pacific countries are ranked by the global football body. On the global ranking, Australia is the only country from the Asia-Pacific that ranks in the top 50. 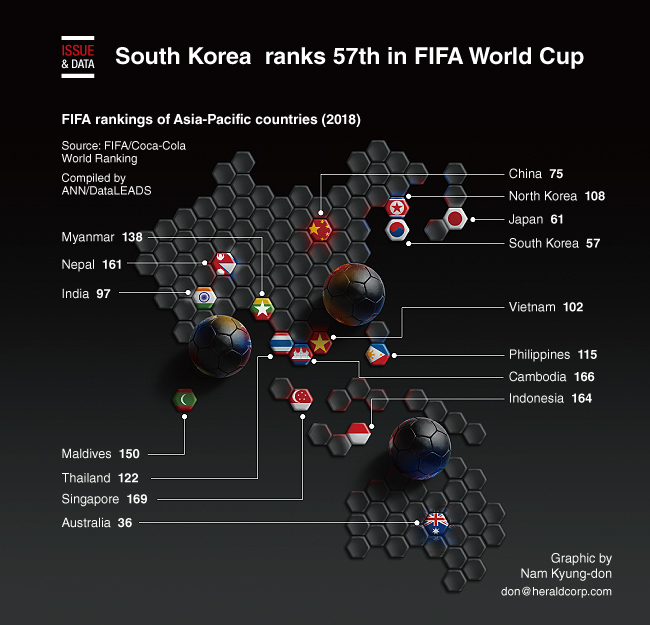 South Korea is ranked 57 and is the only Asian country that has qualified nine times for the world cup. It is also the only Asian country to win the most entertaining team award at 2002 FIFA world Cup. Two players from the team were also voted members of the MasterCard All Star Team, the only Asians to be voted in. The South Korean team is in Group F with Germany, Sweden and Mexico. Japan is ranked 67 and will be making its sixth appearance in this year’s World Cup. It is one of the most successful Asian team having qualified for the World Cup for last six consecutive years.